The public launch of the Penzance BID to the wider business community took place at Penwith College on Wed 12th Feb in a packed lecture hall. It ended with an overwhelming show of support for "something must be done" (to improve Penzance Town Centre) and agreement that a Penzance BID should be pursued further to define the "something" and provide the resources. It has been a dispiriting time for businesses and householders affected by flooding. The Government's response has been sadly lacking and a political disaster. There is news of a sequal! Properties in council tax band H.
We already have town centres blighted by wrenching change, spiraling business rate and high parking charges. This measure, if approved by Parliament unchanged, could create a new blight on our seafronts in Cornwall. The new legislation will replace a voluntary scheme run by insurers at the Government's request. Speak to your MP if you do not like what you read. "British Property Federation and Council of Mortgage Lenders warn unexpected exclusions in Water Bill could leave millions without affordable flood insurance". Click here. 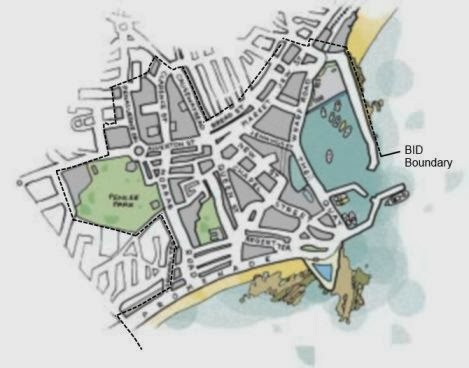 The launch of the proposed Penzance BID to the wider business community takes place on Wednesday 12 Feb at 5.30 pm on the Penwith College Campas (Zennor Building). All businesses with premises within the proposed BID boundary (see map ) are encouraged to attend.